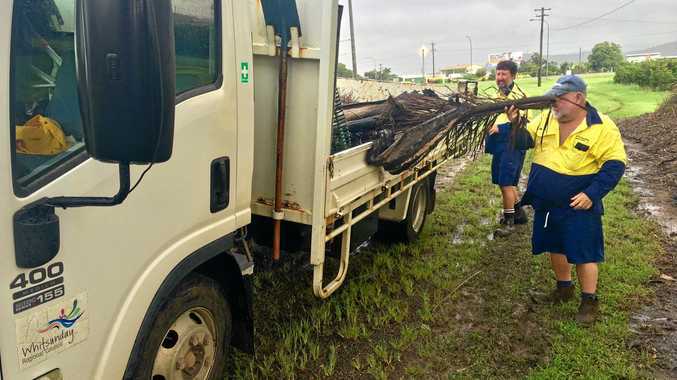 Whitsunday Regional Council workers cleaning up this morning. 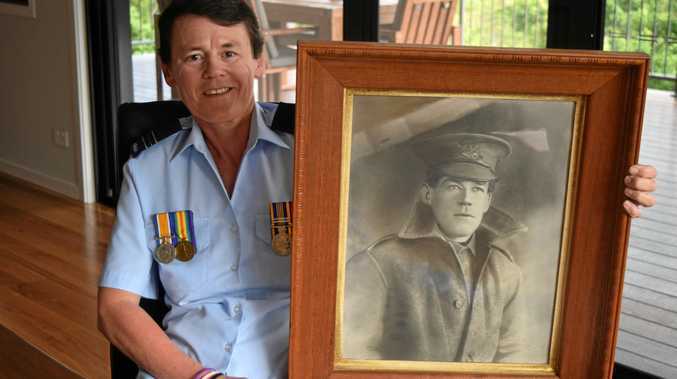 AIRLIE has weathered the storm overnight with power outages and all flights cancelled into Hamilton Island for the day. Energy Queensland Limited's principal corporate communications advisor Brett Judge said of the 730 homes without power because of "cyclonic activity" across the Mackay, Whitsunday and Bowen region, around 600 were back on. "There are currently 47 customers in Mandalay and Jubilee Pocket without power and unfortunately we can not give a restoration time," he said. "While there is a BoM cyclone warning present we can't send our guys out but we can some fix things remotely." Wind gusts of 106km/h have been recorded on Hamilton Island at 5:40am this morning and Proserpine has had 92mm of rain over last 24 hours. 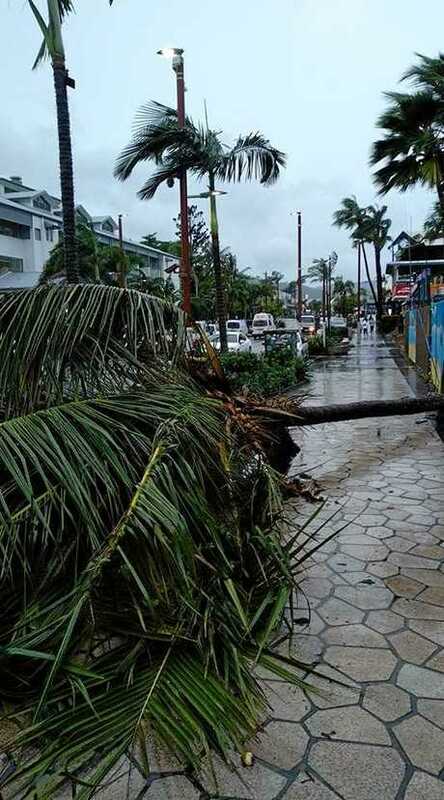 Tree down in Airlie Beach's main Street yesterday. Heath Cleary? At the moment no planes have been cancelled only delayed at Whitsunday Coast Airport. 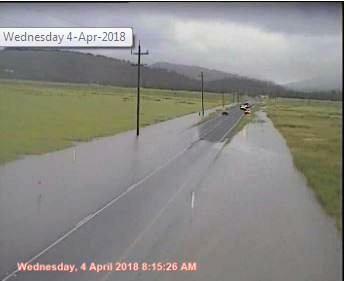 Hamilton Plains is still passable however there is water on either side of the road. 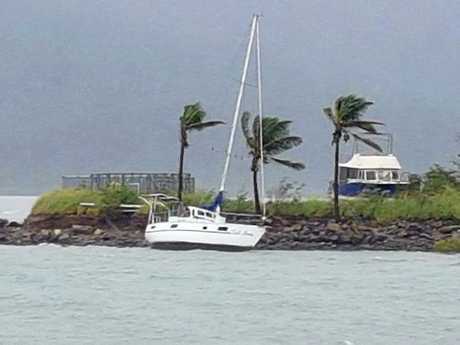 All campgrounds, walking tracks and public moorings in the region are closed due to Tropical Cyclone Iris. Whitsunday Regional Council has closed all aquatic facilities, excluding the Collinsville Swimming Pool, to the public today. Council Parks and Gardens crews were out and about early today to clear up some loose debris around drains and paths. Mackay Hospital and Health Service has cancelled Dr Braniff's gynaecology clinic at the Proserpine Hospital today. Regional Harbour Master yesterday announced the closure of the Whitsunday Pilotage Area from 10am and Cruise Whitsundays has confirmed that tours for today and tomorrow have been cancelled. There will be no Resort Connections services operating from today.